National Book Development Board-Philippines celebrates World Book and Copyright Day at 3rd floor of SM Aura, Taguig on April 23, 2015 at 10:00am-3:00pm. 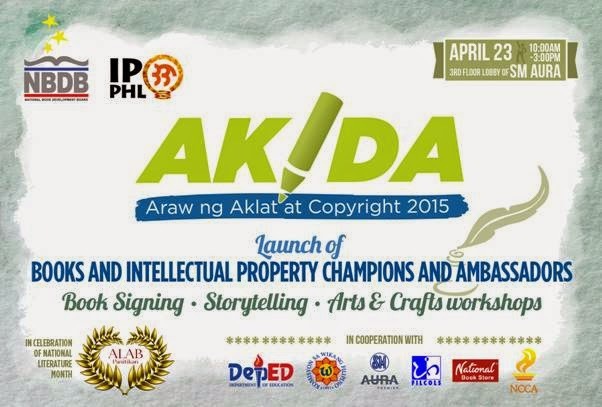 Dubbed as AK/DA: Araw ng Aklat at Copyright, this day pays tribute to all authors and promotes a deeper respect for their copyright. One of the highlights of this event is the public launching of our first batch of Book Champions and IP Ambassadors, who have all committed to actively support the campaign of NBDB and IPOPHL all throughout the year. There will be storytelling sessions, an arts and crafts workshop, a photo exhibit, and book signing. The launch of the Book and Copyright Champions will likewise be held during the event. Admission is FREE. Program will start promptly at 10:00am. Book signing of authors and IP champions to start immediately after the program, while cocktails will be served.